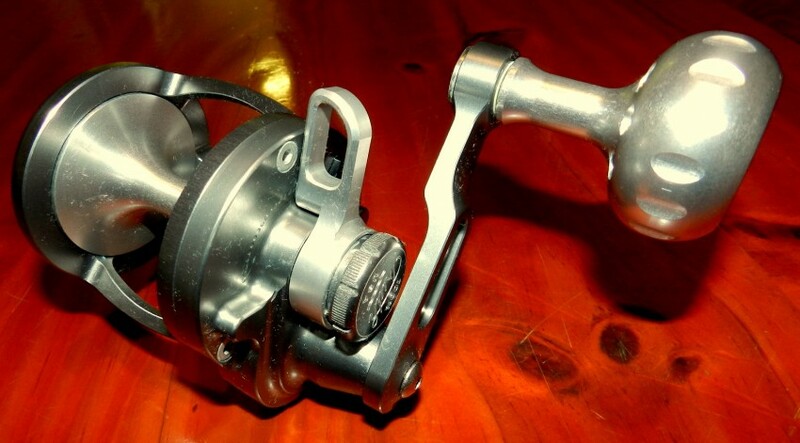 As guys on our Fishing Holidays in the Florida Keys know I have for the last two years being working with a new reel manufacture in the US this being Release Reels the reason being I was somewhat taken with their add which stated Life time warranty and hand made in the USA. In the early days it was my job to put these reels to a torture test which in the Florida Keys is very easy and with my test team of sharks all went very well and they pasted with flying colours so much so they are now my go to reel and the boat has four on at all times. Recently they have had to change their name to Truth Reels rather than have my mish mash of words and as my English teacher once said after a poor exam ” The problem with Rodney’s English is that he knows to many words none of which he can spell or put in the right place ” I am coping some text from the new Owners Manual to explain all. Our founder and president, Wes Seigler , has been designing high performance products for the last 10 years. 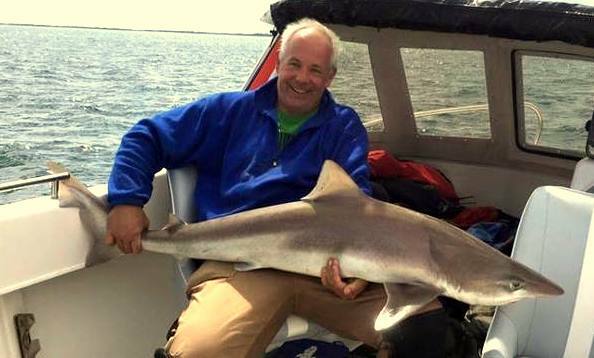 Once a former international professional cyclist, he retired and moved to his true passion of fishing. 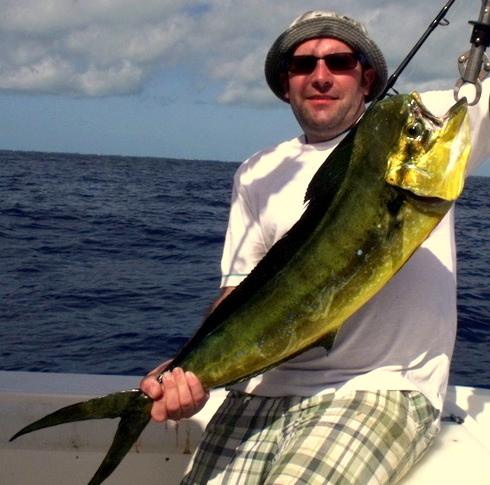 In 2009, he began thinking about the fishing reel industry . By listening to our customers’ ever-changing needs we began making innovative changes to our products. Our business is about giving our customers the best possible day on the water – be it with the grankids or in a $ 100,000 tournament. It’s all about the experience and having a great time. Originally we operated as Release Reels with the goal to create reels that are among the lightest, strongest, and the most competitively priced in the industry and carries a lifetime warranty. Another company in the marine industry legally challenged our Release Reel Trademark. After reviewing the pros and cons of fighting this challenge, we quickly realized we wanted to grow to be much more than just a fishing reel company and our current space was cluttered with many other similar named brands. So we took this opportunity and turned it into something that we felt truly represents not only who our founder is, but the philosophy of our company as well. 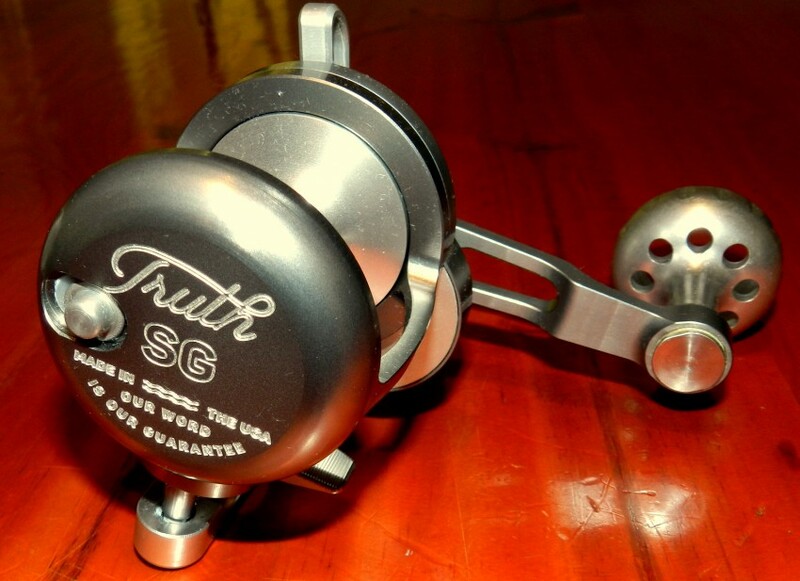 We changed our name to Truth Reels because it honestly seemed to fit. Our word is our reputation. We have a lifetime guarantee. Every part is made in the USA. We love what we do. We love to fish. 100 % that’s the Truth. So there it is from as they say from the horses mouth not mine. To go along with the new name the SG has had a few minor tweaks such is the hands on approach of the company. New Features Strike button : Rod clamp : Crankarm assembly : improved AR system and bearing : Drag lever detent system. 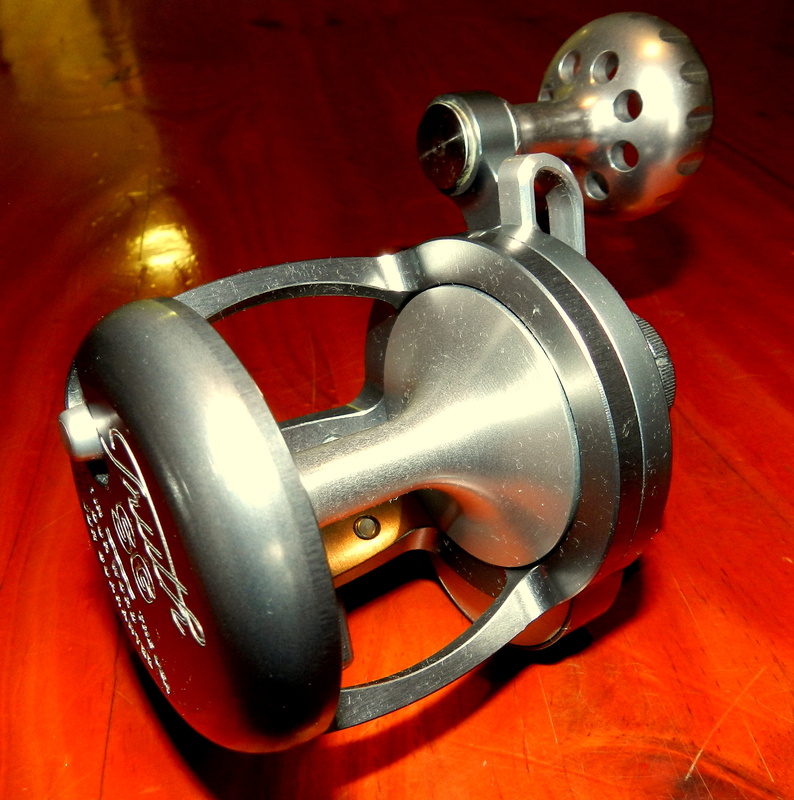 To go along with a very impressive specification Just 13.2 oz : Gear ratio 6.1 : 34 in per crank : Max drag Strike 18 lb full 25 lb : Capacity 375 50 lb braid : Ceramic spool bearings : Carbon drag washer. Now they come in a very useful canvas bag so if you are looking for a new reel have a long look at this one we have had fish to near 400 lb on a SG and with its lifetime warranty not many reels come close. 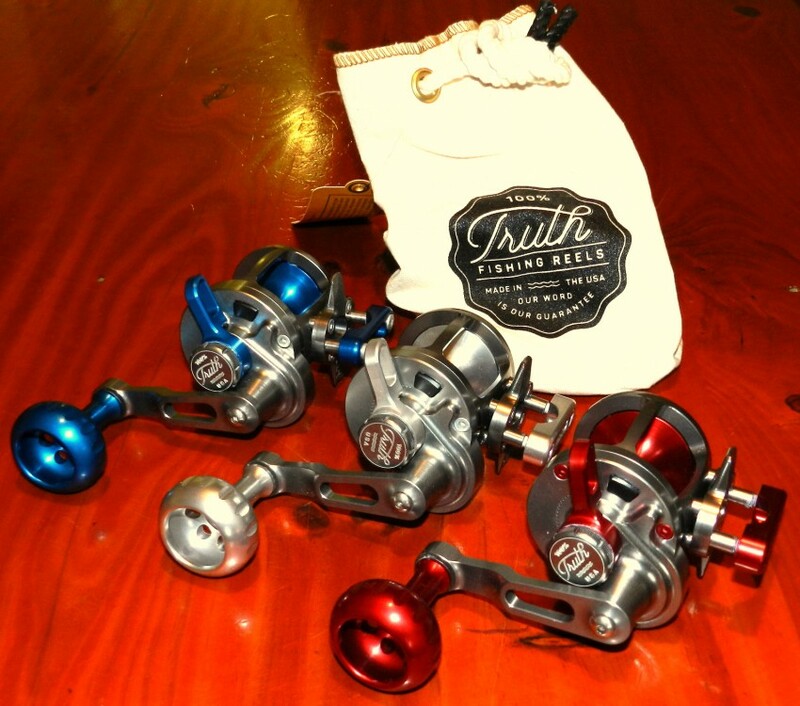 I am supplying these reels to order at just £ 269 they all come with full UK Lifetime Warranty so once you have paid your hard earned thats all you will ever have to pay now thats peace of mind. I have recently received some very interesting underwater footage from my friend Rupert Dury who has been using a Waterwolf camera while tope fishing. 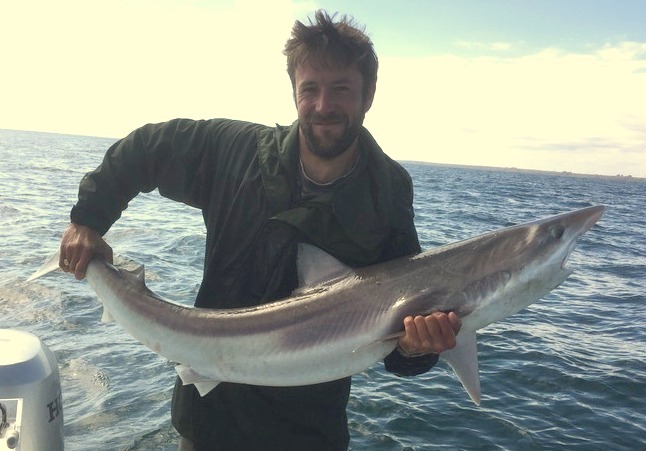 Over recent years Rupert has shown just how good the tope fishing can be here up in the north-east of the UK and I was lucky to be onboard when we both smashed our tope PB’s Rupert with a 71 lb fish and I had a 63 lb one, on a stunning day I will remember for a very long time. While the Waterwolf camera will never win any prizes for film quality it does show it what is happening to your baits and just what is down there while you are fishing. It is also fantastic at letting you see just what the bottom is like and you can adjust your rigs to suit a lot better with a bit of knowing just what’s there. 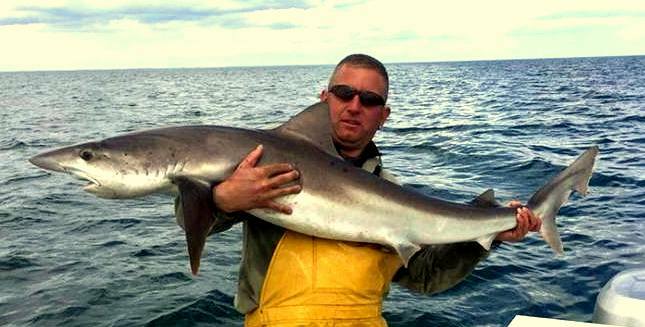 The first and the best bit is just how the tope took the bait and the short comings of a normal down tide rig and sett up. What is strange when you see the first take is there is no reaction from the angler, well the angler never knew there was a fish taking the bait. With a bait hard on the bottom as the fish takes the bait and moves up tide nothing happens at the rod till the fish goes down tide and takes up the slack I wonder just how many times in the past I have brought a bait back and blamed crabs when it was fish taking bites out but on slack line. 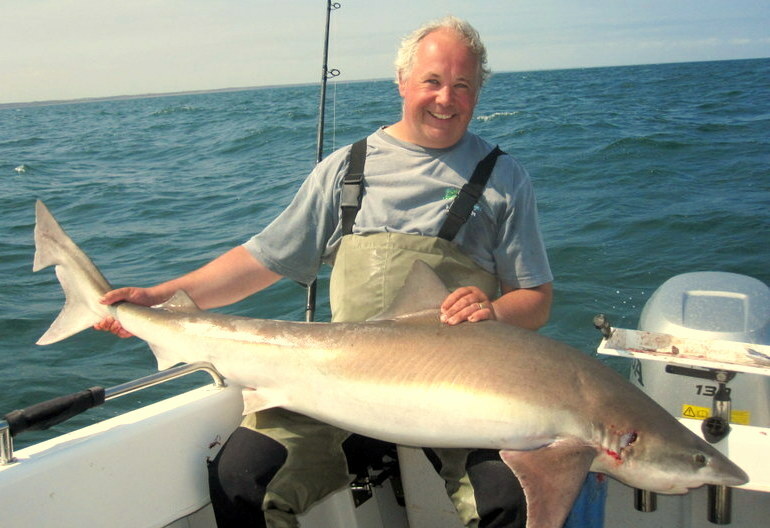 Also what it shows very clearly how if the hook is in the front of the bait the fish misses the hook biting as in normal at the back of the bait a very good reason for using pennel rigs or making sure the hook is at the back of the bait. After watching the videos Rupert has tried types of float fishing which takes out the slack line problems and is looking at the way he puts the hook in the bait and you can see by the photos is nailing the tope. 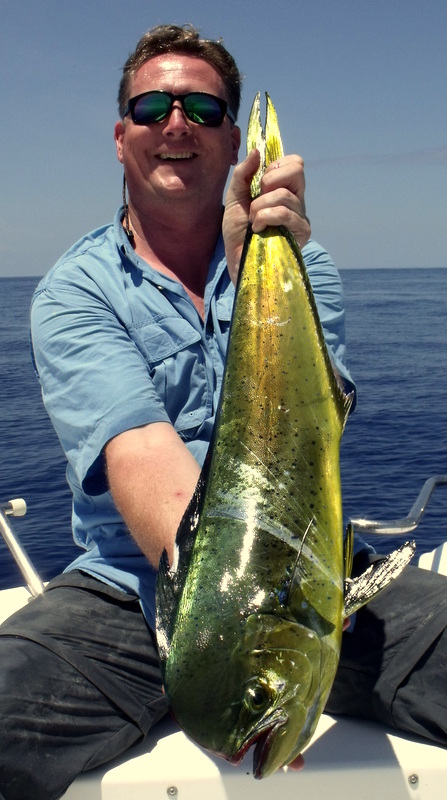 I still after all my years of doing Fishing Holidays in the Florida Keys get a wicked smile thing about newbies on their first trip to a local restaurant seeing dolphin fish on the menu. 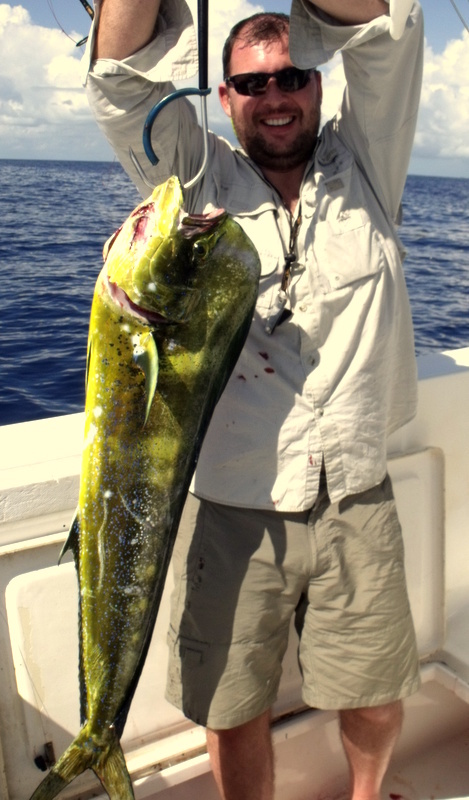 Not sure why but the local name for dorado or mahimahi if you prefer and never managed to find out why so as they say answers on a postcard but what I do know this fish is the star of fishing in the Keys with peak numbers in the summer. What really floats my boat about this fish it ticks all the boxes and then some you can catch it any way you want bait, spin, troll or fly when they are on the feed manic does not even come close. 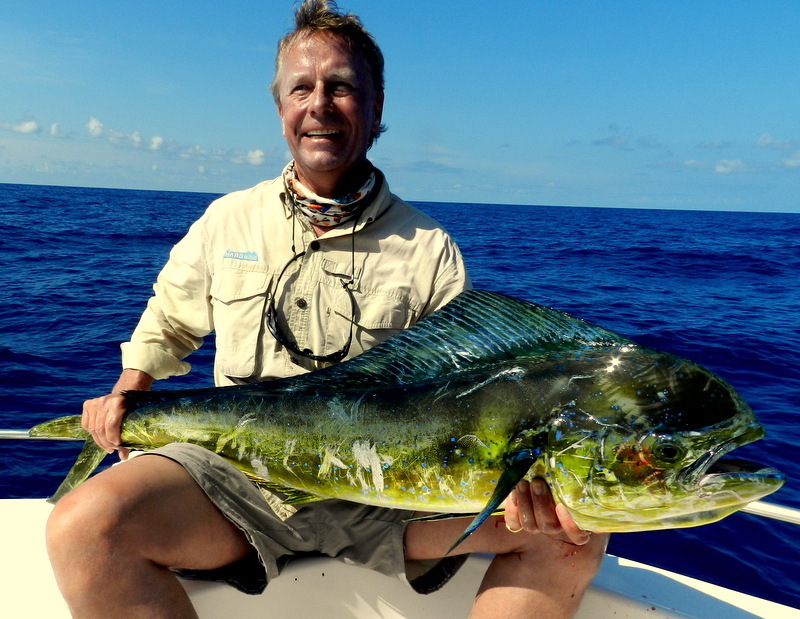 A few years back after a heady day with them offshore and most on fly the more than happy angler said ” you have just screwed all my UK fly fishing the sight of nearly 50 yellow, green and blue fish all trying to get to my fly first will be in my head forever “. The facts about dorado still blow me away they live a max of 5 years most don’t even get to 3 and a local university found one that was just under a year old and went 39.9 lbs yes 40 lb in their first year that’s just how hard they feed. They breed at just 4 months and many times in a year having over 100,000 eggs each spawn this is how they keep their numbers up an other interesting fact they have been clocked at 57.5 mph awesome. 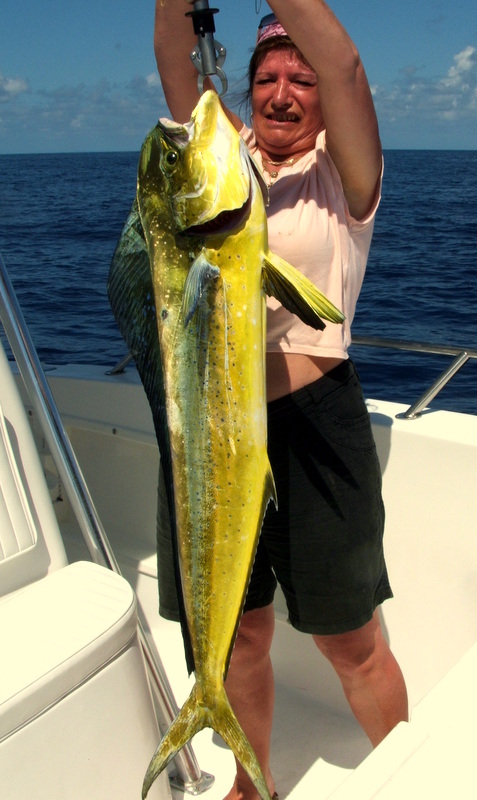 One of our best fish over the years was had by a regular Leslie and as you can see by the photo nearly as big as her just an other day Leslie was showing the boys how to fish. One of our biggest nearly 30 lb cow fish even took two baits at the same time I suppose when a fish sees food offshore they only have one thing on their minds that is to eat it and the fact they already have a hook in their mouth no problem. On a personal note you might already guessed it they are one if not the top fish in the keys on a plate yum yum .